MadREP President Paul Jadin Speaking at the announcement of WEDC’s idle site grant for the former Oscar Mayer site. Laying the groundwork for the redevelopment of the former Oscar Mayer plant, Lt. Governor Rebecca Kleefisch today announced the City of Madison is receiving a $500,000 state grant to help finance infrastructure work on the site. The Idle Sites Redevelopment Grant from the Wisconsin Economic Development Corporation (WEDC) will be used to assist developer 910 Mayer LLC as it reconfigures outdated infrastructure at the site to deliver gas and electricity to each individual building on the 67-acre parcel. The work also includes upgrades at the buildings to comply with the federal Americans with Disabilities Act. 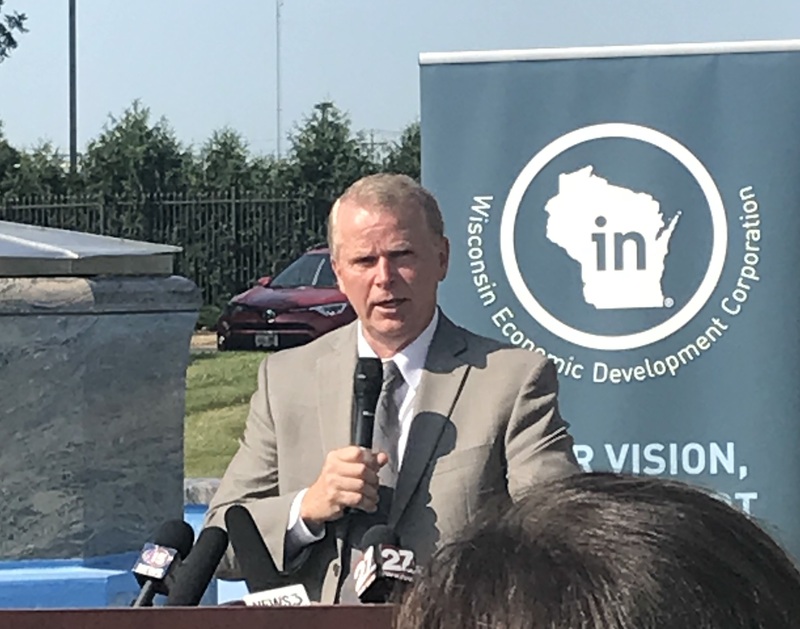 Reconfiguring the gas and electrical infrastructure will cost $1.8 million–$500,000 of which will come from the WEDC grant, with the rest funded by the developer. Work is now underway to redevelop the facility into a business and light industrial park called the OM Station (Old Madison Station). Instead of a single user, multiple tenants will utilize the refurbished center.910 Mayer LLC, a partnership between Rabin Worldwide and Reich Brothers, plans to repurpose many of the existing buildings on the site and attract thoughtfully chosen tenants that will create sub-communities on the campus. The infrastructure work, which is phase two of a six-phase redevelopment project, is now underway and is expected to be completed by July 2019. The entire $18 million redevelopment project is expected to be completed in 2025. Once the redevelopment is finished, the property is expected to be valued at between $30 million and $35 million–more than double its current value. “We are grateful for the generous support of WEDC in helping us fix and modernize the electrical and gas infrastructure for the site, allowing us to jumpstart the redevelopment and bring in new users and jobs back to northern Madison,” she added. Oscar Mayer had been at the location since 1919, and it served as the company’s headquarters since 1957. The plant officially ceased production August 2017, and 910 Mayer LLC purchased the property in October 2017. The city is working with the new owners and stakeholders to reposition the site for future use. Mayor Soglin has appointed a 13-member Oscar Mayer Strategic Assessment Committee comprised of Common Council members, neighborhood residents, and persons with labor and business experience to oversee a public process and provide guidance along with city staff and consultants to develop a strategic assessment of the site. Since the program’s inception, 18 communities have received more than $15 million in grants for economic development projects expected to create nearly 5,000 jobs and have an economic impact of more than $600 million. Madison is one of four municipalities to have received an Idle Sites Grant in 2018, joining Janesville, Hudson and the Town of Grand Chute, which also received $500,000 each. Madison received two earlier Idle Sites Grants: a $534,000 award in 2014 for the redevelopment of the Royster-Clark site on Cottage Grove Road, and a $500,000 grant in 2016 for the redevelopment of the Garver Feed Mill.